February is the month of love, it's also National Canned Food Month. During the month of February we asked our residents to share the love and donate a canned food item to fight hunger in our community. It's all part of our Pillar Passions program. Pillar Properties is a long-time, locally owned family company and we take that responsibility seriously. We are committed to the Puget Sound region and we share that commitment with the people who call our apartments home. Each quarter, Pillar Properties and The Century partner with a different charity to raise goods and awareness. We kicked off this year with a food drive to support Move For Hunger. Move For Hunger is a non-profit organization that works with relocation companies to collect non-perishable food items, and deliver it to food banks all across North America. 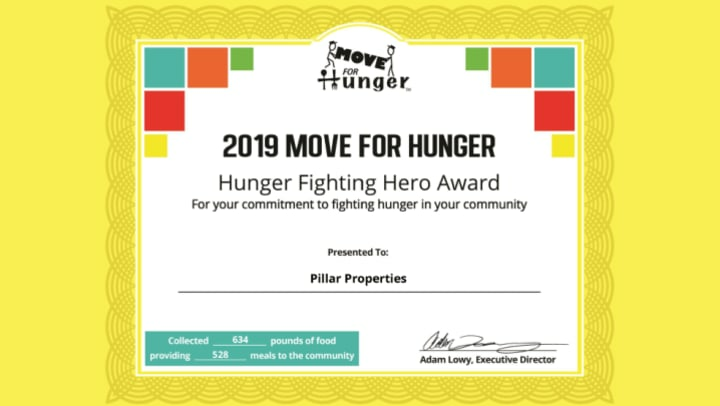 Pillar Properties and The Century work with Move For Hunger throughout the year as one of the first multi-family company partners. When a resident moves, they don't have to hassle with moving all the food in their kitchen. With the help of Move For Hunger, we can collect all of the non-perishable food items and get it to our local food bank, Northwest Harvest. During our February food drives, Pillar Properties collected a combined total of 634 pounds of food, which will provide nearly 530 meals to our neighbors in need. For more details, check out the feature published by Move For Hunger! We are honored to be a part of the Move for Hunger initiative and work to make a difference in our community. We can't thank our residents and team members enough for their generosity and support!